Paula Johanson Books: Trudeau Biography Announced! Good news came today! 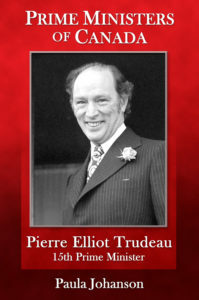 My biography of Pierre Trudeau is scheduled for release from Five Rivers Publishing. They've got a great cover for it, one that fits well into their series Prime Ministers of Canada. What can you say about a prime minister for whom suspending civil liberties with the War Measures Act wasn’t even his most controversial decision? At least, it wasn't to those folk who are still stuttering mad about his National Energy Program or White Paper on Indian Affairs, forty years later and counting. This book was fascinating to write! I hope that canoeists and outdoor enthusiasts will like the focus on Trudeau's wilderness interests. Click here for a link to their listing. The book will be available December 1st, 2016, but orders can be taken now.